"Cleaning wheel spokes" is often a job best forgotten. 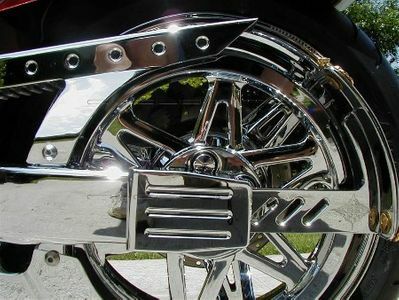 Not only are spokes close together, but they are often under body trim and fenders or behind mechanical parts. Nothing is more frustrating than having a shinning finish and chrome trim, and not being able to remove the crud around the spokes. 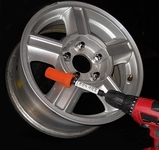 Top of the Line solves this problem with quality wheel cleaners and unique tools designed for hard-to-reach spokes or slots. We can make it easy for anyone to clean any wheel with very little effort. Gosh, that sounds good to the ears doesn't it? We also have products to complete restore faded black trim to its original deep sheen. These are simply wiped-on and lightly buffed. Start with the S100 Wheel Cleaner and your choice of brush or the new super polishing ball. It can be used to remove build-up or to polish the metal. Once the hard work has been done, it's a simple process to keep you bike's wheels in pristine condition. Many thanks to Reza at Cycle Image (cycleimage.com) in San Deigo, California for the breathtaking photo above, and on our home page. Their customizing and plating is The Best!